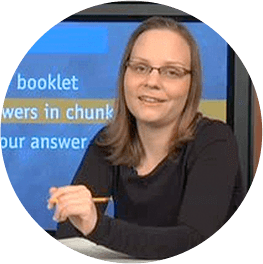 Welcome to this lesson on pronoun reference one of the most important topics on the SAT writing section. Definitely pay attention and definitely consider recapping this episode 'cause there's a lot to learn and you won't want to miss this when it comes out to test day. So let's have a look on what you need to know. First of all you definitely need to know what pronouns are. Pronouns stand in the place of nouns and you may recognize them from these examples. Words like 'it', 'they' et cetera. One way of remembering what pronouns are is to picture a conjugation chart from your foreign language class. The words down the side, like 'I', 'he', 'they' those are pronouns. And we have an example where you can see pronouns in action just so you know exactly what I'm talking about and the reason they're so important is that they are tested in every type of writing question all throughout the test so definitely be on the lookout and now let's look at the three rules you need to know. So as promised here are the three rules you should know about pronouns. The first one is that a pronoun must refer to a noun. If you have a pronoun that you see in the sentence you should go find the noun it's referring to like if it says 'she' you should go look for the woman that's being discussed. And the second rule is that a pronoun must agree with that noun. If your pronoun is female the noun you are talking about has to be female. If your pronoun is plural the noun you are talking about has to be plural. 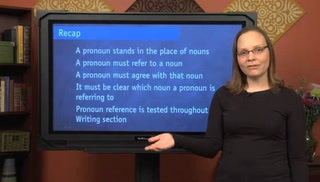 And lastly it must be clear which noun a pronoun is referring to. So it can't be the case that a pronoun might refer to one noun or might refer to another. You have to know exactly which noun is being referred to. Let's go one by one through this in more detail. First up a pronoun must refer to a noun if you see a pronoun look for the noun it's referring to and if you can't find that noun, the sentence is wrong. Very simple let's see some examples. 'On TV tonight, they reported a decline in unemployment'. Now we might talk like that but it's not going to be right on the SAT. The word 'they' is a pronoun so it should catch your attention and then you should realize that 'they' is not talking about any noun in the sentence, so maybe this means 'the anchors' that the sentence as is is not correct. So you would either want to circle this if say it were underlined as an answer choice in the improving sentences part of the test or look for an answer choice that was similar but actually specified who was being talked about if you were in say the improving sentences part of the test. Another example, here goes. 'Quinn complained the musicians were playing so loudly that she couldn't tolerate it.' Again we talk like this but it's not grammatically correct. Find the pronoun and the pronoun is 'it' and then see what noun is being talked about and there is none. 'Quinn couldn't tolerate it.' It might mean something like the noise but the noise is nowhere to be found in the sentence so the sentence as is, is incorrect. Last example, 'Laura and her boyfriend don't seem very compatible, since she loves to run and he hates it.' Yet again we probably talk this way but it's not correct. Find the pronoun the pronoun is 'it' and then find the noun that it's talking about and it's nowhere in the sentence. I guess we are talking about 'running' and one thing that you should know is if you are referring to something in the sentence and that something is a verb in this case 'to run' clearly a verb you can't use a pronoun. Pronoun has the word noun in it 'cause it can only stand in for a noun. But there is an expression which may sound funny but it's grammatically correct and lets you refer to a verb like this and that's 'doing so'. Again it sounds kind of awkward but that's the way to fix the sentence. So you want to look for an answer choice that looks like that if you are referring to a verb rather than referring to a noun. So those are three examples of the first principle. Let's look at the second principle. When you have a pronoun it must agree with the noun. So if you see a pronoun look for the noun it's referring to. That's very similar to what we were doing before but before if we couldn't find a noun we said okay it's wrong and we quit. In this case you need to see if there actually is a noun if the pronoun then agrees with the noun and if it doesn't it's wrong. To recap, agreement means that the genders have to match like if you say 'he', you have to be referring to a guy and the plurality and singularity has to match. If you say 'they' you have to be talking about plural people or plural things and especially you need to watch out for the word 'they' on the SAT. 'They' is a plural word, very simply so you can't use it to refer to individual people or individual organizations so you can't use it to refer to some random person 'cause 'they' is plural, 'people' are singular and also organizations are groups. Like a country like Canada you don't say 'they' you say 'it' or clubs or schools or anything like that always singular. So be on the lookout for 'they'. Let's check out some examples. 'A good doctor knows their patients' medical histories well'. We all talk like this but it's not right. 'Their' is our pronoun and 'their' like the word 'they' is plural but it's referring to the doctor and a doctor is singular. So there are several ways to fix it although the main thing is that you just have to recognize that it's wrong and it needs fixing. You could say something like 'his' if you want to pretend the doctor is a man. You could say 'her', you could say 'his or her'. It doesn't matter so much because on the SAT you'll only have to either identify there is a problem by selecting that portion of the sentence or find another sentence where it's been fixed. Some way like this so you don't have to provide the words just basically recognize that 'their' isn't going to work. Next example, 'The committee voted to move their meeting time an hour later.' First of all we look for the pronoun and we find the word 'their' and then we check what it refers to and it refers to the committee so there is a noun but it doesn't agree with the noun. 'The committee' is singular, 'their' is plural so we need a singular pronoun like 'its'. Incidentally some people confuse 'it's' with an apostrophe, 'its' without. It's worth knowing the SAT is not going to test you on distinction so don't worry about it. Last example, 'Liberty High isn't known for being academically strong, but their sports program is exceptional.' I would be inclined to say the sentence but in SAT land I know it's wrong because 'their' is plural and 'Liberty High' is singular so yet again funny though it may sound we say 'its'. And third principle to look at. There has to be clarity of reference. Meaning if you see a pronoun and you look for the noun it's referring to, just like the other two principles you have to be clear on what noun it is referring to. If there are two nouns that might be referring to and you can't tell which one the pronoun is actually referring to the sentence or the answer choice is wrong. Let's look at some examples. 'When Omar met Rob for lunch, he was rude and kept taking cell phone calls.' This one is probably pretty obvious the 'he' is unclear if it means 'Rob' or 'Omar' and the main thing is you have to recognize that the problem and look for an answer choice that fixes it. For instance an answer choice that has 'Rob' there instead of 'he' there. Another example, 'Kurt tried to talk with his father, but opening up was hard for him.' Yet again we have the pronoun 'him' and it does refer to a noun but it actually refers to two nouns and we are not sure which one so we would want to look for an answer choice that made the pronoun reference clear. One that say had 'Kurt' here instead of the word 'him' and that would solve the problem so know that we have gone over those three principles that every pronoun should have a noun it's referring to. That it should agree with the noun that it's referring to and should agree with exactly one noun it's referring to. Let's tie that all together with a practice SAT problem. So here we are with a sample SAT question you'd find on the identifying errors portion of the test. So to recap we're going to read through first of all and see if anything jumps out at us and if not we are going to go through piece by piece looking for the underlined portion that's wrong. If we do find one's that wrong we circle it and that's the answer if not we select no error at the end of the sentence so let's start by reading. 'Even though the average citizen cannot list a single member of the Presidential Cabinet, they should nonetheless not underestimate its influence on the domestic and world affairs.' Now I'm not sure if it jumped out at you but I will tell you what the right answer is to select which is to say the wrong part of the sentence, talk about why and then we will run through the other pieces and see what you should have been on the lookout for and where they might have been wrong in a slightly different problem. So first of all, the answer that you should select is 'B'. The word 'they' is a pronoun so you should automatically pay close attention to it because pronouns are often wrong on the SAT and then go through the three rules. First of all what does 'they' refer to does it refer to something in the sentence? And it does, it refers to this guy right here. 'The average citizen should nonetheless not underestimate the importance of the Presidential Cabinet'. So good it does have a noun it refers to, it does have antecedent. The second issue is does that pronoun agree with the antecedent and that's where the problem emerges here. 'They' is plural but the 'average citizen' is singular and we often in casual speech don't treat the 'average citizen' as singular we often talk about a generic person as 'they' but that is not correct on the SAT or technically in our casual speech either so that's the problem. Now let's just run through the other possible answer choices and see what you should have watched out for on the off chance they might have been wrong. Let's see so 'the average citizen' not too much interesting there but you should read it and say do people talk like that, is there such a thing as the average citizen and yeah that's a common figure of speech. So it's fine. Next up, 'nonetheless not' if you just focus on 'nonetheless not' it does sound a little funny maybe like a double negative but you should be watching out for but in context it's fine. 'The average citizen should nonetheless not underestimate its influence.' So that is fine. Might sound a little funky but it's fine. Something to keep in mind is on this portion of the test just 'cause you don't like the way something sounds it doesn't mean it's wrong you should really see whether something is grammatically broken not just whether it kind of feels funny to you. So 'C' is okay and 'D', 'its' is a pronoun so we should always make sure that it follows our three rules. First of all does it have a noun it refers to and it does it refers to 'the Presidential Cabinet'. Does it agree yes because 'its' is singular and 'presidential cabinet' is singular and lastly is it clear what it's referring to. Yeah, there is only one thing that 'its' could be referring to in the sentence so we are all set and that's the SAT problem. Let's wind that all up with the bottom line. So here is a recap of what we've covered with pronouns here. Three basic rules. First of all a pronoun must refer to a noun as soon as you see a pronoun go look for the noun that it's talking about. Second of all if you do find that noun make sure that the pronoun and the noun agree with each other so if the pronoun is feminine the noun should be feminine. If the pronoun is singular the noun should be singular and we especially want to watch out for the word 'they' because it sometimes is used to refer to singular people or things and 'they' is not singular. Lastly it must be clear which noun a pronoun is referring to so if you have a pronoun and you can't tell which noun in the sentence the pronoun is talking about the sentence is wrong and that's pronouns in brief.